A mysterious disease that is killing beech trees is spreading across parts of the United States. 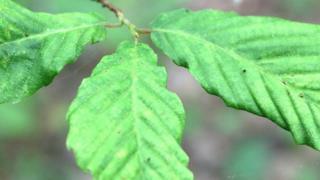 Scientists say the disease, known as Beech Leaf Disease, has been recorded in Ohio and Pennsylvania, and parts of Ontario in Canada. They say the cause of the tree killer needs to be identified in order to halt the spread. It is expected to spread widely if the deadly pathogen becomes established in the wider environment. In the UK, beech trees are widespread and are the main species in many woodlands. The tree is often referred to as a queen species, second only to the oak. "The initial symptom is a dark staining pattern on the leaves," explained Carrie Ewing, a PhD student from Ohio State University. "Later, it seems that the leaves become shrivelled, almost leathery in texture. Eventually, the tree will die." Initial studies suggest that there is no sign of insect infestation or the presence of other vectors, adding to the mystery of how the disease is spreading. Ms Ewing's colleague, Prof Enrico Bonello, added: "We don't quite understand how that transition from the banding to the stage where the leaves become all crinkled up and become very leather. "Eventually, the buds die and desiccate on the trees." Prof Bonello observed: "The trees don't die very fast. It takes a few years." Several species of beech trees are known to be vulnerable to this mysterious killer. As well as the American beech (Fagus grandifolia), the disease has been recorded in the European (F. sylvatica) and Oriental beech (F. orientalis). This has raised concerns that the pathogen could spread to other parts of the world where beech trees are plentiful, such as the temperate biomes in Europe. Biosecurity is a key concern because researchers assume the introduction or spread of the disease is likely to have been the result of human activity. "The spread has been quite fast," explained Prof Bonello. "In fact, it reminds me of other invasive alien species causing forest health problems, like emerald ash borer in North America or ash dieback in Europe where the spread starts on a very small scale, very slowly and then the spread picks up almost exponentially, spreading unabated."